Nearly half of individuals browsing the Web -- 48% -- do so on more than one type of device, and among those who search, nearly four in 10 conduct the search only on a smartphone in an average day, according to Google. Multiple devices require marketers to keep the message consistent across screens. Eighty percent of individuals use a smartphone, 67% use a computer, and 16% use a tablet, according to recent stats from Google that analyze how devices continue to change the way individuals search and interact with the world around them. The results of the findings are based on a sample of opted-in users, and reveal how, when and where people use their devices throughout the day. More searches occur on mobile than on computers or tablets for 15 of the 24 hours in a typical day. And growth among specific market segments reveal the highest among home and garden, up 45%, per Google. Apparel has seen a 40% spike, compared with the prior year. Consumer electronics rose 40%, rounding out the top three. Knowing when and where consumers use these devices can help marketers understand how and why to target the ads. Beginning in the morning, smartphone use is consistent throughout the day and into the night, while computer use peaks around 8 p.m. and slightly drops off. The study also reveals the top four places that people use their smartphones: home, work, store, restaurant and bars. The finding reveal that 57% of cross device users interact with multiple devices daily. Of those, 21% are concurrent users, meaning they use a smartphone or tablet along with a computer while at home. On any given day, more than one-fourth of individuals using more than one device only use their mobile phone, almost twice as many as those who only use a computer. On average, individuals spend about 170 minutes daily on smartphone, compared with 120 minutes on a computer and 75 minutes on a tablet. Many move back and forth between devices. 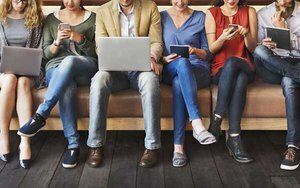 When at home, one in five individuals use another device concurrently with their computer, which makes it even more important for advertisers and markets to keep the message consistent. Interestingly, the average YouTube mobile view session is more than 40 minutes, and among individuals who watch content on YouTube, 42% do so on a smartphone. 1 comment about "Mobile Searches Account For 15 Hours Daily". John Grono from GAP Research, October 11, 2016 at 2:32 a.m. I don't get the headline "Mobile Searches Account For 15 Hours Daily". Para 8 says “On average, individuals spend about 170 minutes daily on smartphone. So people spend 15 hours of their 170 minutes a day on the smartphone using Search?! May I suggest the headline reads “Mobile is the preferred Search Device for 15 of the 24 hours in a Day”.